NGC3621 is a spiral galaxy located in the constellation Hydra. The apparent size is 12 x 7 arc minutes and brightness is 9th magnitude. Although the galaxy is classified in spiral, its structure is indistinct. NGC3621 lies about 20 million light years from Earth and is also cataloged as PGC 34554 and Bennett 46. 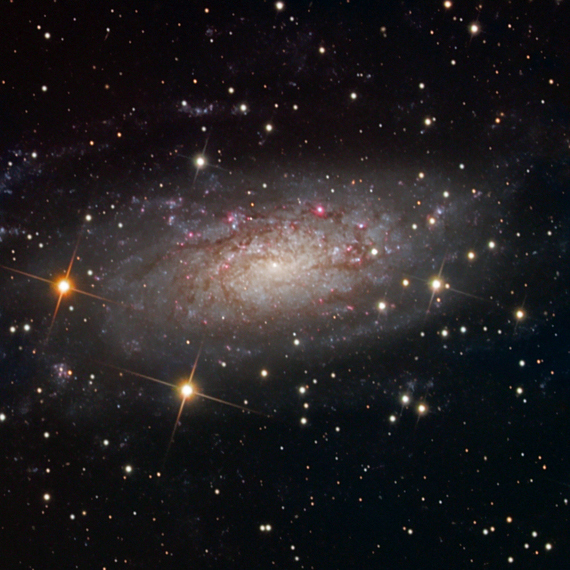 Daniel Verschatse has imaged this galaxy in the past and his version of NGC3621 is avalable in his gallery. Processing Notes: This image was taken during a moonless period of very good seeing at CTIO. The seeing monitor averaged about 0.7 arc seconds (and as low as 0.4" on the morning of March 18th.) The 44 subexposures FWHM ranged from 1.51" to 1.91" as measured by CCDInspector. I used CCDStack to combine the subexposures, CCDSharp (2 iterations on the master Luminence frame), and Photoshop CS for final processing.